Bazaars have been an integral part of our traditional settlements since ancient times and have followed an organic pattern of growth. As the population of the cities steadily increase along with increasing incomes, shopping centers have become areas of intense concentrated activity. Along with the growing number of shoppers, there has come the increasing number of cars and vehicular traffic, and today most shopping areas have become chaotic, unsafe areas. The problem calls for our urgent attention. However, in order to take action in keeping with our lifestyle, it would be good to try and understand how bazaars and shopping centers have evolved over time, and how recent planning has failed to effectively respond to steadily changing conditions. A study of the city of Shahjahanabad and New Delhi, along with post Independence development over the last sixty eight years, will help give a fair idea of where we are headed, and what needs to be done to arrive at some meaningful solutions. The city of Shahjahanabad drew its inspiration from the form and layout of cities in Iran, in particular the city of Isfahahan, which had evolved over a period of time and reached its culmination in the sixteenth century, creating a spectacular concept of planning and urban design way beyond anything developed in the Western world. At the heart of Isfahan, lay the enormous space of the Maidan-e-Shah flanked by shops, palaces, and mosques, which terminated at one end in the massive arched entrance to the Bazaar, a fabulous winding network of linked covered markets, extending over several kilometers. Alongside the market, were a series of courtyards, containing caravanserais, madarsas, local mosques, craftsmen’s workshops, and dwelling units. The layout of Shahjahanabad was inspired by the open space and the landscaped gardens of Isfahan, and an attempt was made to create a similar major space in the new city in the creation of Chandni Chowk, laid out as a landscaped boulevard along a water canal, with wide tree sheltered pedestrian walks. This grand retail avenue beginning from the main gate of the Red Fort and extending to the Fatehpuri Masjid, formed the central spine around which the walled city developed in an organic network. On either side of Chandni Chowk, a series of separate winding streets came up, each dedicated to specific retail trades, which formed the commercial and retail hub of the city. What is worth noting is the fact that the whole area was, and still is, a concentration of intense activity, with a mixture of different overlapping uses. The area accommodated retail shops, craft workshops, warehouses, and a variety of residences grouped around courtyards, defining separate katras and mohallas. In addition there were mosques, temples and gurudwaras, in prominent locations along the main street. All of this constituted a mixture of organic development, steadily changing over time. In fact, the whole of the walled city of Shahjehanabad reflected this character of spontaneous ethnic growth. When the British decided to build the city of New Delhi, as the capital of British India, they turned their back on the entire traditional background of the city of Shahjahanabad. They decided to impose a garden city concept on a vast expanse of land, at a safe distance away from the walled city. A city that was totally alien in concept, with an imprint of order, along with a geometric structure and very low density, consisting of individual houses set in large plots of land. The intention was, to emphasise the difference between the rulers and the ruled. At the centre of the main axis connecting the dome of the Viceregal Lodge to the dome of Jama Masjid in the walled city, was located the new commercial area of Connaught Place, from which major roads of the city radiated outwards. Connaught Place was conceived as the main shopping complex for the ruling elite, a circular structure with a colonnaded arcade flanking large shops. The structure was broken up into separate blocks, with a wide central road around a circular park designed for the leisurely movement of horse drawn carriages, soon to be replaced by cars. This shopping complex was a totally alien concept, and reflected nothing of the complexity and lively mixture of the traditional Indian bazaars. In the post-Independence development when the 1961 Master Plan for Delhi was prepared to accommodate the vast influx of refugees that had come across the border, the planners sought inspiration from the post-war Western concepts of law and order, instead of looking to the traditional heritage of urban development that existed in their own backyard. They imported the concept of rigid single use zoning, along with an equally rigid layout of roads, plots and setback regulations. This has been the basis of all planning and urban design in our context for the last fifty years, and still persists to this day. It is interesting to note, that despite this imposition of a plan that does not allow for ad hoc organic growth, actual development on the ground in many areas has tended to follow its own path in a variety of different ways. This can be clearly seen in several parts of Delhi. In the 1961 Delhi Master Plan it was proposed to develop 15 District Centres, which would serve as the major centers of activity, each with 200 to 350 retail shops, general business, commercial and professional offices, cinemas, restaurants, and other places of entertainment. Until 2007, when the Delhi Master Plan 2021 was notified, only 10 District Centres had actually been built, and in most of these the shopping component meant to serve a population of 1.5 to 2.5 lakhs, did not come up. This was partly because the retail shops that were planned in the District Centres, were too expensive, or were just not in the right location to serve the surrounding residential areas. What did in fact happen was, that unauthorized shops came up within residential areas on smaller plots where rents were affordable, and location was more convenient. A large number of unauthorized retail complexes following the traditional pattern of haphazard organic growth, came up in several different areas across the city. Many of these were later accepted and approved by the local authorities, but as can be imagined this kind of development completely upset the basic system of order, defined in the Master Plan. At a residential area level retail spaces were located in the proposed Community Centres, and Local Shopping Centres, all planned in linear or rectangular forms with a series of individual shop plots sold to private developers. As per the regulations, the use was restricted to retail on the ground floor, with a single residence in one and a half floors above. With the pressure of changing demands, control regulations have been ignored, and almost all shopping complexes have been subjected to extensive overbuilding, and have been completely transformed. Residential use has been almost totally replaced by commercial use. Along with this change, and the massive influx of cars, it has resulted in conditions of chaos. The organised commercial centre, of Lutyens’ New Delhi has also been subjected to change. With the recent restoration of the facades of Connaught Place, New Delhi’s premier shopping complex looks very much like how it was, as originally conceived. However, with the introduction of the metro, and the phenomenal increase in the number of visitors, the manner in which it is used has undergone a complete change. The original leisurely movement of traffic around the central circle, has been overtaken by the haphazard and unruly movement of all kinds of traffic, including cars, two wheelers, and scooter rickshaws. 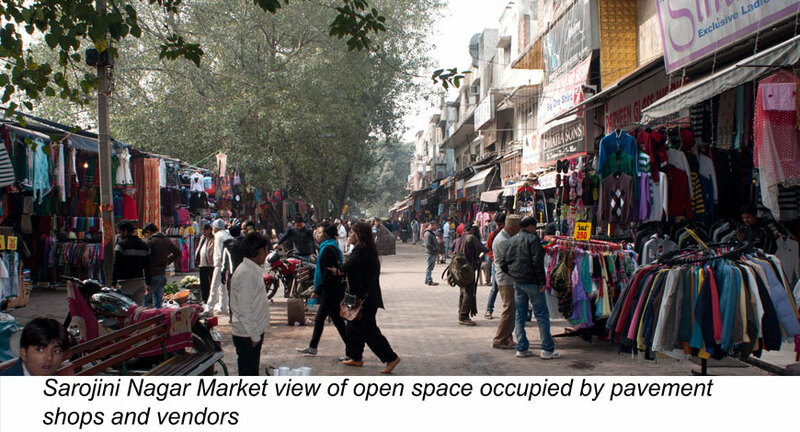 Large numbers of pavement shops, along with mobile vendors, and food stalls occupy every available open space. The invasion of vendors is at its height on weekends, when a series of mobile shopping stalls successfully connect the arcades from one block to another providing shoppers with an unusual and unique new experience of continuity. Along with this, vendors have occupied large areas of pavements on both sides of the central ring road. The large number of visitors coming by metro create a flowing wave of pedestrians over the whole area, directly mixing with vehicular traffic. In such a situation, the car park areas are completely surrounded by human traffic. In order to deal with this, complete and immediate pedestrianisation of the whole area, is the obvious answer. This calls for careful detailed planning and urban design of the whole area, with all movement areas being clearly defined, and specific spaces allotted for all kinds of informal retail, including pavement shops, parking of mobile vending vans, food shops, etc. The transformation of the vast area available between the colonnaded arcade and the central park into a sheltered pedestrian enclave, would create a unique new urban experience in the heart of the city. The problems created by the steadily increasing number of cars and street vendors, is now common to every shopping centre across the city. This includes all the larger shopping complexes like Karol Bagh, Lajpat Nagar, Sarojini Nagar and Khan Market. It is time now to accept that all shopping centers need to be reorganized to allow for the free and unobstructed flow of pedestrians, completely free of vehicular traffic. This is something that is possible only with systematic redesign of the open space in each and every shopping area. It also calls for the active participation of the municipal agencies, urban designers, traffic planners, the police, and the shop owners. Cars as a means of access, is important in our current context, but they need to be isolated from all areas of intense pedestrian concentration. The current policy of building multistory car parks with commercial space on the lower levels in areas close to existing shopping centers has so far proved to be counter productive, as the developers gain substantial revenue from the sale of the commercial space, and could not care less as to how the car parking is managed to serve shoppers actual needs. Witness what has happened at the Sarojini Nagar car park, and also the multistory parking complex on Rakabganj Gurudwara Road near Connaught Place. In both cases because of poor management shoppers prefer to park along the roads rather than being subjected to endless delays in the parking and retrieval process. Car parking areas need to be properly planned to provide direct and easy access to shops, as well as to properly serve short term and long term parking needs. 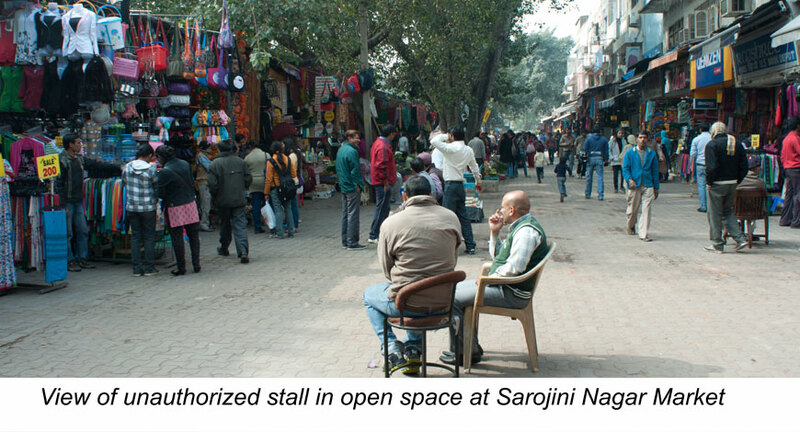 Finally it would be of interest to draw attention to the plan of Sarojini Nagar Market as an example worth emulating in some respects. Although planned in a rigid rectangular framework the entire shopping space is completely free of vehicular traffic. All traffic is restricted to the surrounding roads on all four sides. Over a period of time, all residences on upper floors have been converted to retail and commercial use. In the traffic free space within the outer boundary walls, shoppers are able to move freely, except for the fact that the overwhelming number of pavement shops have created untidy, haphazard, and unsafe conditions. This however is something that can be easily rectified with careful management control of the entire complex, along with upgrading of the existing shopping structures. Upmarket shopping malls serve a very limited section of our society. Variations of traditional shopping bazaars with their overlapping of mixed uses, would more effectively serve the needs of our city residents.